The Soyuz TMA-01M mission (No. 701, ISS mission 24S) in October 2010 flew the first spacecraft in the Soyuz TMA-M (Soyuz-700) series. It had the goal of delivering three members of the 25th long-duration crew to the International Space Station, ISS. A newly modified Soyuz TMA-01M spacecraft was launched from Baikonur Cosmodrome, Kazakhstan, on a mission to the International Space Station, ISS. The Soyuz FG rocket lifted off from Site 1 in Baikonur on Oct. 8, 2010, at 03:10:55 Moscow Summer Time, exactly as scheduled. The docking of Soyuz TMA-01M spacecraft with the MIM-1 Poisk module on the International Space Station was scheduled on Oct. 10, 2010, around 04:02 Moscow Time (00:02 GMT). The spacecraft and its crew was expected to remain at the outpost until March 2011. 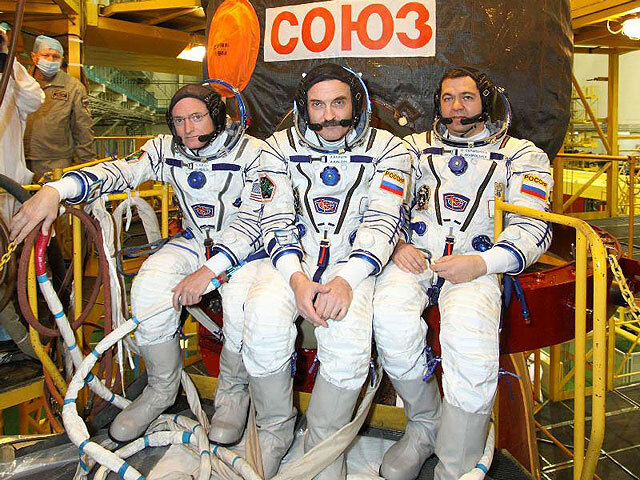 Onboard the station, the crew of Soyuz TMA-01 joined three other members of Expedition 25, who arrived onboard Soyuz TMA-19 spacecraft in June 2010. They were scheduled to return to Earth in November 2010. 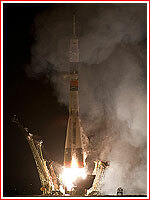 The Soyuz TMA-01M mission initiated a flight testing of the Soyuz TMA-M spacecraft family. It is the latest step in a series of gradual upgrades to Russia's legendary manned transport. According to previous revisions of the ISS mission schedule, the launch of Soyuz TMA-01M was planned for Nov. 16, 2009 and Sept. 30, 2010. The Soyuz TMA-01M spacecraft docked to the MIM-1 Poisk module on the International Space Station, ISS, Sunday, at 04:01 Moscow Time (00:01 GMT). 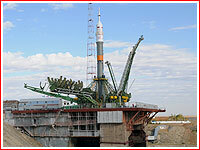 The docking was conducted in a fully automated mode, mission control in Korolev said. Three new members of the 25th long-duration crew to the ISS, Russian cosmonauts Aleksandr Kaleri and Oleg Skripochka and NASA astronaut Scott Kelly entered the station three hours after docking. On Nov. 15, 2010, Expedition 25 Flight Engineers Fyodor Yurchikhin and Oleg Skripochka conducted a six-hour and 27-minute spacewalk. The primary assembly and maintenance objectives of the spacewalk were to install a multipurpose workstation on the starboard side of the Zvezda service module’s large-diameter section and relocate a television camera from one end of the Rassvet docking compartment to the other. Research objectives included cleaning and removing a robotics experiment known as Kontur, short for Development of a System of Supervisory Control Over the Internet of the Robotic Manipulator in the Russian Segment of ISS, from the port side of Zvezda into the Pirs airlock; installing a new materials experiment on a handrail on the Rassvet module, and collecting samples from underneath insulation on the exterior of Zvezda and Pirs. Skripochka and Yurchikhin completed all their tasks except the relocation of the television camera, due to interference by insulation where it was to be installed. The spacewalk was completed at 4:22 p.m. EST. The Soyuz TMA-01M spacecraft undocked from the MIM-2 module of the International Space Station on March 16, 2011, at 07:27 Moscow Time, (04:27 GMT). After the spacecraft reached a distance 50 meters from the station, Aleksandr Kaleri was planned to conduct a five-minute test of maneuvering the spacecraft under manual control. The vehicle would then depart the vicinity of the station. The braking maneuver to leave the orbit was planned for 10:03:17 Moscow Time and the separation of the crew module from habitation compartment and service module was due at 10:27:57 Moscow Time with a projected landing at 10:53 Moscow Time, 86 kilometers north of Arkalyk, Kazakhstan. 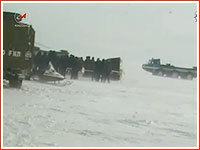 The Soyuz TMA-01M did land as scheduled on March 16, 2011, at 10:54 Moscow Time in the snow-covered steppe north of the town of Arkalyk in Kazakhstan after 159 days in space. Rescue personnel found the crew capsule on its side with the parachute still attached to the vehicle. 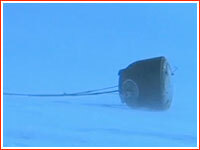 Following the landing of Soyuz TMA-01 on March 16, 2011, rescue personnel found the crew capsule on its side with the parachute still attached to the vehicle. The snow-covered landing site of the Soyuz TMA-01M spacecraft on March 16, 2011. 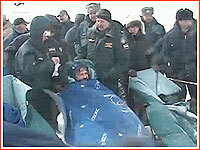 Soyuz TMA-01M's commander Aleksandr Kaleri seconds after his extraction from the crew module following its landing in the snowy steppe of Kazakhstan on March 16, 2011.